Wisconsin instead picks winners and losers. How is that working? I once attended a talk by George Stigler, a Nobel-winning economist who was widely viewed, and who viewed himself, as a conservative, and given to a business audience. At one point, he told the audience that If they announced, as a matter of principle, that they would no longer accept government subsidies, he would send a letter praising their high-mindedness, and sell their stock short. What does it mean to be “business friendly”? Stigler’s comments point out that there are at least two meanings of the term. One is friendly to particular businesses, helping them become profitable. The other embraces the free market, which can often be very unfriendly to some businesses. Despite Smith and those who followed him over the following two-and-a- half centuries, mercantilism is alive and well today. One sign is the tendency of governments to pick winners for tax breaks. The next graph shows the distribution of non-farm jobs in Wisconsin, according to surveys by the US Bureau of Labor Statistics. The first number is the number of jobs in thousands. The second is the percentage each represents of the total. 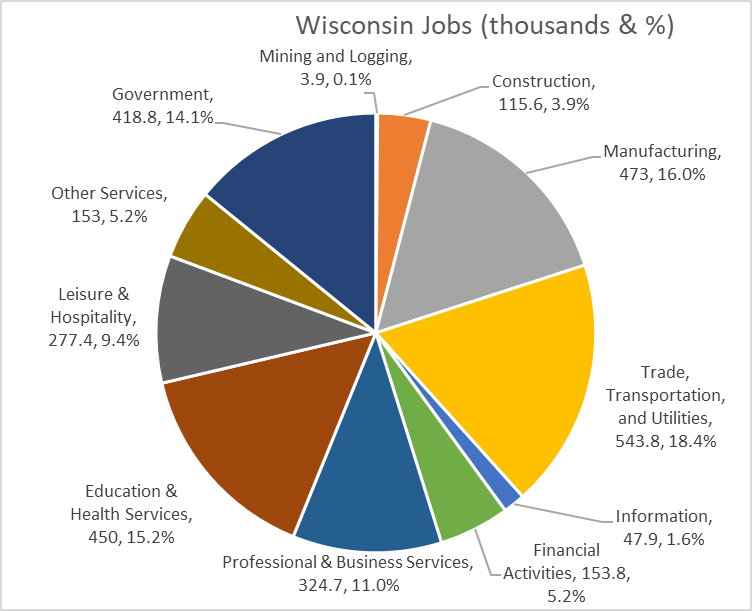 The smallest category is mining and logging, at 3,900 jobs—0.1 percent of total Wisconsin non-farm jobs. If the categories were established today, mining and logging would likely not have rated a separate category. Yet mining is one of two categories that enjoys special solicitude from the Wisconsin governor and legislature, even to the extent of allowing mining lobbyists to rewrite Wisconsin laws to weaken environmental protections. The other category that has received particular concern from Wisconsin’s government is manufacturing. 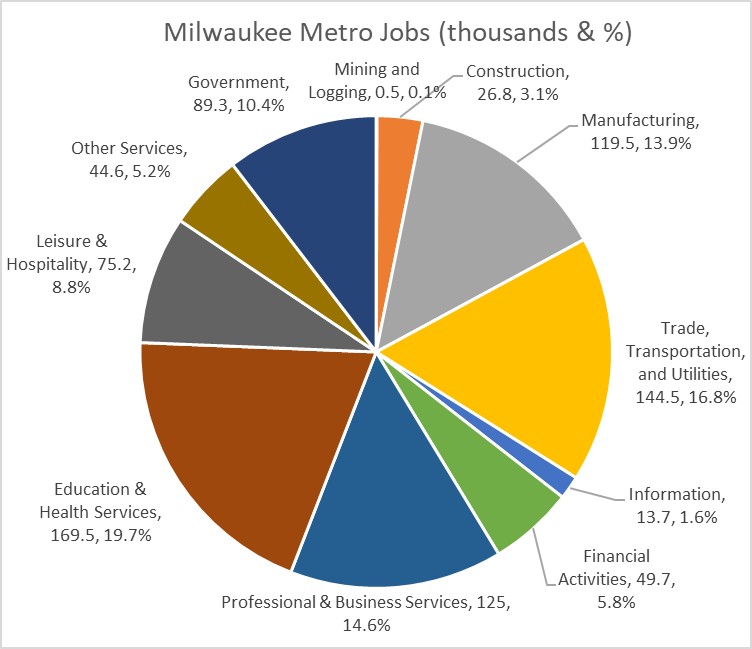 With 16 percent of Wisconsin jobs, and 14 percent in the Milwaukee metropolitan area (see below), manufacturing jobs form an important, but hardly dominant sector. Wisconsin has been particularly solicitous of manufacturing. The Tax Foundation has calculated the effective tax rates for various types of business in each state. 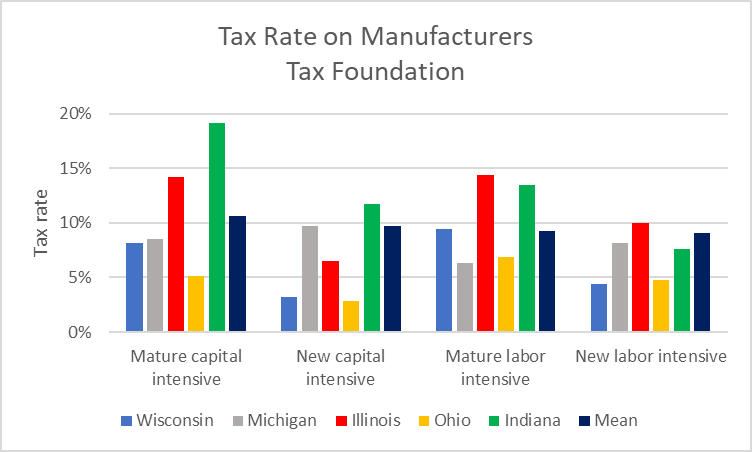 The foundation, which skews conservative, rates Wisconsin as having the 15th lowest taxes among all states for capital-intensive manufacturers, likely stemming from the Manufacturers and Agricultural tax credit. One justification for singling out manufacturing for special aid is that it historically offered higher pay. It allowed people without a college education to gain entry to the middle class. 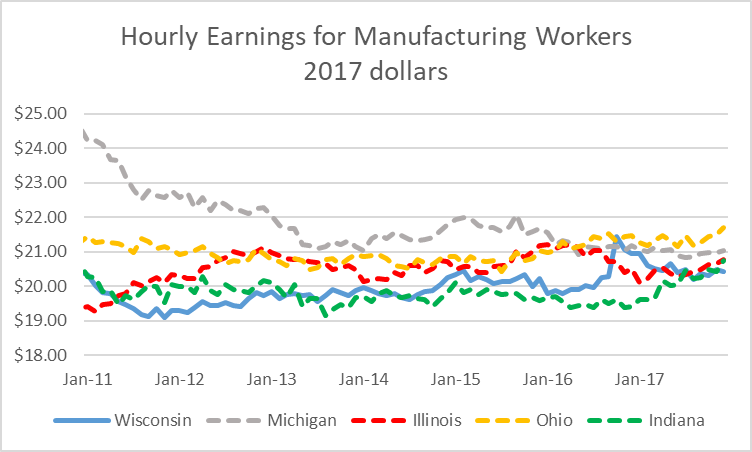 But that has been changing.The next chart shows average pay for production workers in Wisconsin, Michigan, Illinois, Ohio, and Indiana, the Midwest states where manufacturing played a dominant role. I adjusted the dollars to their value in 2017 dollars. It appears that pay in the five states is converging to a number around $21 per hour, or $42,000 per year if there is no overtime. Particularly notable is the decline in Michigan. I suspect this may reflect the decline in union membership and influence, as well as its dominance in the world auto industry. How effective have state’s efforts to attract manufacturing jobs through low taxes been? 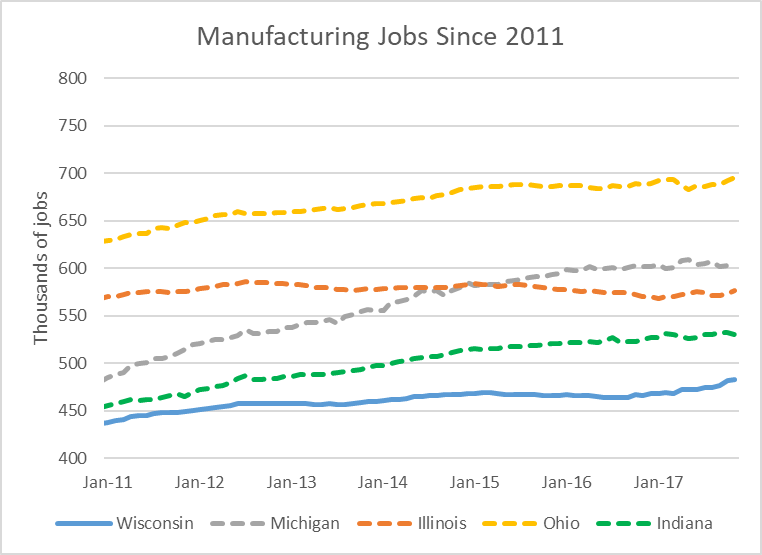 The next chart shows the number of manufacturing jobs (in thousands) since 2011 in the same five states. As the US economy clawed back from the Great Recession, four of the five states have seen an increase in jobs. The exception is Illinois whose legislature and governor have spent much of that period arguing about how to deal with its underfunded public employee retirement obligations. Wisconsin, while seeing some growth, has lagged other states, particularly Indiana. Comparing state manufacturing job growth with state tax rates, it is hard to see any consistent pattern. It is not clear what, if any, role taxes play in job growth. The following graph shows the Tax Foundation’s calculation of the tax burden on four categories of manufacturers. Combined with the previous graph, it offers evidence to both support and contradict the proposition that low taxes lead to growth. For example, Indiana has the highest taxes on three of the four manufacturing categories; yet, it had the highest percentage job growth over this period. Conversely, Wisconsin does not appear to benefit from its generous credit on manufacturers. To keep 600 jobs here in Wisconsin, I asked the Wisconsin Economic Development Corporation to offer Kimberly Clark the same deal for jobs as Foxconn. It is hard to argue with voters in the Fox Valley that they should subsidize industry in Racine County and not get similar subsidies when their jobs are at risk. See a recent Post-Crescent article in which Fox Valley Democrats propose aid to keep paper industry. There are several problems, however, in a return to mercantilism. If it succeeds in influencing corporate decision making, it distorts economic decision-making. Conversely, if the corporation makes the same decision it would have made anyway, it represents a transfer of wealth from taxpayers to corporate owners and managers, helping to increase inequality. Subsidies to employers leave government entities with fewer resources to supply public goods that help attract companies and their employees. For example, the recent proposal from the Milwaukee County Parks to charge for parking is enormously unpopular. It can be viewed as the result of the continuing decline in state aid to the county, a decline resulting from the need to fund corporate subsidies while fulfilling promises to reduce taxes. Corporate location decisions are increasingly influenced by quality-of-life issues. That pattern is increasingly true of new enterprises: people start firms where they already live. 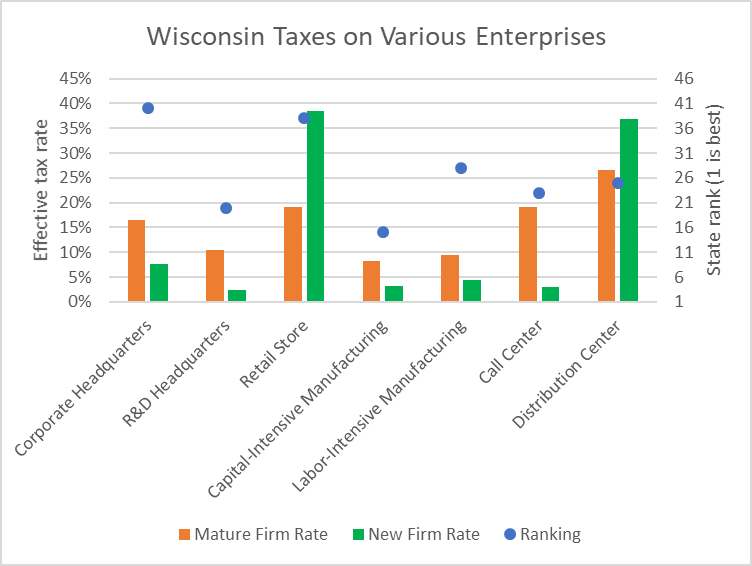 Ironically, then, the race to subsidize favored firms may make Wisconsin less competitive in the long run. Well done and thought out. Data wonk at top of his game. Republicans are charlatans that have never embraced the “free market.” Career Politician Scott Walker has never worked a day in his adult life in the free market. Nice analysis. I”m with Terry. In 40 years of awareness, The Game has always been about which party picks the winners and losers, without recognition of the negligible economic role of govt or politics — in spite of Sisyphusian political efforts to shove their noses where they don’t belong. ‘Free Market’ was always just an ad campaign, part of the propagandist language for rapacious extraction capitalism. It is a losing campaign, as China is so winning. The far right is desperate to stay in power. They will appear to concede to the will of the people to win elections. Caution. Do not forget the mania towards a constitutional convention, which, as we well know now was never about budgets and deficits. It was, and still is, about controlling voting power, controlling the people’s remaining political power. Making a few strategic ‘concessions’ at this time can buy them the time to continue unraveling our institutions to their advantage. The US economy has never really shed its mercantilism roots. One only has to look at how labor has been treated over the course of our history. So called “self-made” men like Andrew Carnegie, J.P.Morgan and even our own Ron Johnson, made their fortunes off the labor of others. And in too many cases, labor did not receive anywhere near the value of their effort. So while Carnegie, Rockefeller, Morgan, Walton, Johnson and others amass enormous fortunes, the people who worked for them live in poverty. There is more, the greed of these captains of industry creates a boom-bust economy, in which cyclical recessions/depressions occur. The busts impact everyone except those who created the problem. If we truly want a capitalist “free market” economy, then our government has to stop its current “pro-business” inclination and become “pro-citizen.” Only then will we actually experience free and open marketplace in which everyone can experience prosperity. Is the public ready for an $8 gallon gallon of milk or an eight dollar bag of cheese. The federal government subsidies a lot of winners. How about $15 bus fare or a $100 street car ride through downtown. Was that you commenting in #2? Sounded like you were supporting Bernie Sanders. 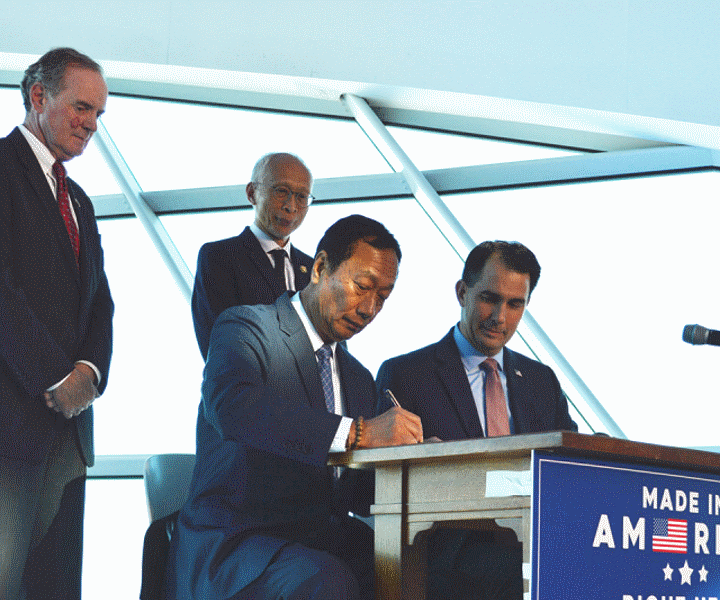 The federal gov’t isn’t giving FoxCONN $4 billion. Why do you persist in your pre-9/11 thinking? How many more times do we have to explain that buildings don’t move. You can’t widen urban streets. Vehicles moving one person downtown clog the streets. The solution is integrated mass transit. Trollies in the densest areas connected to a network busses which get people to their vehicles. Anyone who has owned a vehicle–leaves you out–understands that stop-and-go driving is the worst thing for it. Why are you predicting soaring dairy prices? Will the dairy farmers make a killing? Dig what Rita says in post # 5.